Amplifying Voices, Documenting Evidence, Strengthening Women’s Movements, Organising and Solidarity for Trade and Economic Justice. APWLD invites grassroots women rights organisations and movements to take part in this exciting Feminist Participatory Action Research on Women Interrogating Trade & Corporate Hegemony that aims to develop capacity, tools and resources by women movements and strengthen women’s movements to demand their rights and justice against neoliberal trade and investment regimes that empowers corporations at the expense of the peoples and the planet. After 30 years of neoliberal globalisation, it has been increasingly acknowledged that austerity, privatisation, deregulation of finance, markets and corporations, and trade and investment liberalisation have had a devastating and discriminatory impact on women. This is not just because women are disproportionately vulnerable to the human rights impacts of food insecurity, and degradation of land and natural resources. It is because the prevailing economic model perpetuates, and often relies on, the systematic discrimination and disadvantage experienced by women in order to generate economic ‘growth’. Corporations participating in the global value chains rely on the exploitation and devaluation of women’s labour as a source of competitive advantage. The rationalisation of cutting social safety nets and privatising essential public services is made possible by the availability of women’s unpaid labour to fill the gaps in care work. And the very way in which economic activity is defined requires the complete devaluation, or gross undervaluation, of women’s unpaid work, whether in the home or in family businesses. Work that is considered ‘women’s work’ is not given any economic value, even though without it economies could not function. Central to the current neoliberal development models are the trade and investments rules and regimes which impact every aspect of people’s lives while simultaneously empower corporations at the expense of the people’s human rights and the environment. Globally, there are more than 3000 bilateral or multilateral agreements in addition to the agreements under the World Trade Organisation (WTO) that govern global trade and investment. The WTO agreements had forced countries to open up their markets to allow for transnational corporations to sell goods and services in their country. Public services, whether they were water, health, education or energy were subject to commercialisation, putting the public’s human rights subordinate to the interests of transnational corporations as well as wealthy countries where many of these corporations came from. A continuously expanding interpretation of the Investor State-Dispute Settlement (ISDS) provisions are allowing foreign corporations to sue governments in secret tribunals over any rules and policies that infringes of their ‘expected’ profits and investments, even when these rules are made in the interests of the people or the environment. Globally, 157 of the richest 200 entities are multinational corporations, with Walmart, Apple and Shell accruing more wealth than some fairly rich countries such as Russia, Belgium and Sweden. The recent billion dollar mergers of large agribusinesses have left 60 per cent of the world’s seeds and pesticides market in the hands of just three multinational corporations. Many corporations also makes their profits at the expense of women receiving low wages and working in precarious conditions at the end of their global value chain. This level of inequality, and the accumulation of wealth and power in the hands of multinational corporations continue to drive the violations of women’s human rights. And yet trade negotiations, whether at the WTO or outside are bereft of the active, systematic and meaningful participation of women, communities and people’s movements. The proliferation of trade agreements being negotiated in total secrecy over the last decades or so have ensured that not only women, but also parliamentarians and general public are all being kept out of the room as trade rules with broad ranging implications on our lives are being crafted. 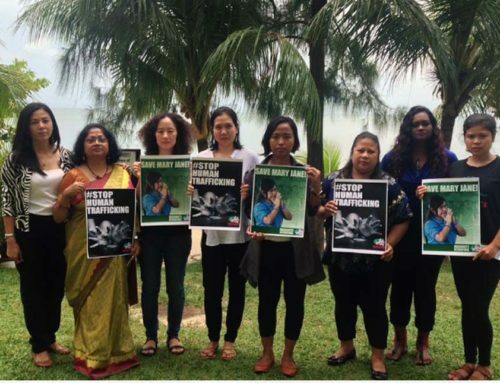 Civil societies measured the negotiation of the Regional Comprehensive Economic Partnership (RCEP) currently being negotiated between 16 countries in the Asia Pacific region has failed the transparency and public participation tests. This follows the similar pattern of the Trans Pacific Partnership Agreement, the North American Free Trade Agreement (NAFTA), the Transatlantic Trade and Investment Partnership (TTIP) to name a few. In contrast, big business lobby groups have had semi-official role inside many of these talks. This patriarchal economic and trade system and governance also relies on the use of power and violence in order to negotiate, carry out and implement neoliberal trade rules and regimes against the resistance and struggle of women and men in local communities in defending their public commons, their livelihood and their environment. APWLD believes that ‘development’ is supposed to benefit poor, marginalised women of the global south. They are best able to identify both the problems and solutions. 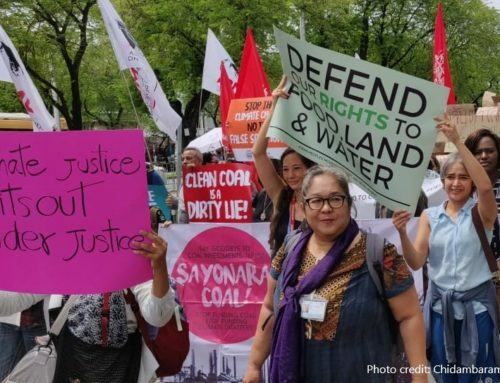 Since 2013, APWLD together with rural, indigenous, migrant, women workers and urban poor women organisations and other movements in the region has made a unified call for Development Justice. Development Justice promotes peoples’ rights, dignity, wellbeing and solidarity while addressing the inequalities of wealth, power, and resources between countries, between rich and poor and between men and women. APWLD believes that in order to challenge the current development model and to claim women’s rights, a strong and autonomous feminist women’s movement are needed. 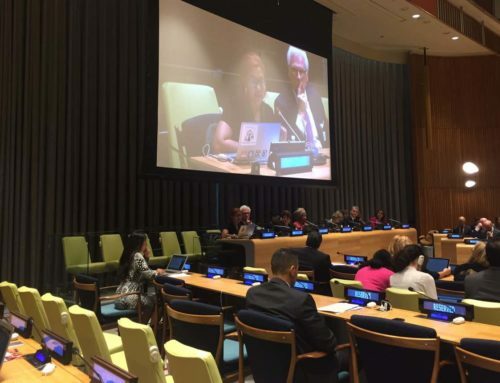 It must extend to strengthening women’s capacity to exercise real power and control over their own lives and the terms on which they engage with social and economic structures – including over trade and investment regimes. They must be supported to build their capacity to document the impact of loss of seeds, domestic market, public commons such as water, health, energy, education, have meaningful engagement in decision making process of trade and other economic policies, able to form strong local feminist movement that work with other movements to demand accountability from state and corporations, and able to push government in tackling systemic barriers to women’s economic and development rights. 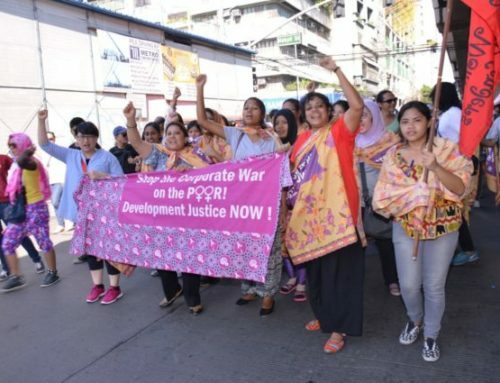 To address the need to increase the evidence base advocacy and the need to have women as vocal and effective organisers, advocates and campaigners in human rights, APWLD will support 6-8 local organisations to conduct Feminist Participatory Action Research for Change on “Women Interrogating Trade & Corporate Hegemony”. The FPAR will take place over the course of 1.5 years and consist of three regional trainings that will allow participants to conduct research projects that relates to their constituencies’ needs, use findings for advocacy and build and strengthen movements. JOIN OUR FEMINIST PARTICIPATORY ACTION RESEARCH FOR CHANGE! Women’s Democratic, Free, Prior and Informed Participation and Decision Making over social and economic structures – includes genuine and meaningful participations of women and communities in economic and trade rules decision-making at all levels. b. Community-owned solutions and demand for economic rights, alternative trade models and systems and development justice. APWLD will provide six to eight organisations with a small grant to employ a young woman researcher and carry out the research including salary and on-costs with the approximate amount of USD 10,000 – 12,000. Research partners will need to appoint a mentor to assist this young women researcher throughout this research programme. APWLD will also support the young women researchers and their mentors to participate in capacity building workshops and provide advocacy or network opportunities. APWLD will select grassroots women rights organisations who will lead the WITCH FPAR in six to eight countries in Asia-Pacific. 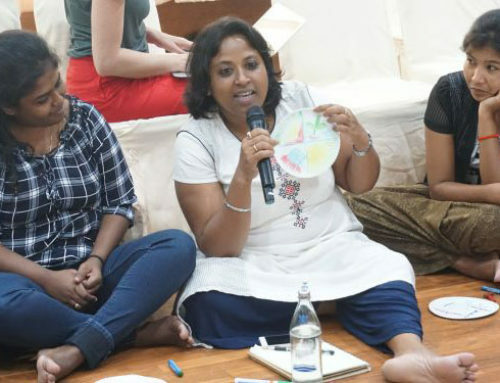 As one of the objectives of this programme is to support and strengthen grassroots organisations, this programme is not suitable for international NGOs and organisations with established funding support or who are already well organised and able to advocate for women rights on trade and corporate hegemony. Committed to appointing a young woman researcher and mentor, either mentor or young women researcher should come from the community where the FPAR will be conducted. Issues and concerns represented in the research focus area. For more information on WITCH FPAR, you can download the Concept Note. Applicants should submit the completed application form, budget proposal and recommendation letter via email to Diyana Yahaya at diyana@apwld.org and Hien Nguyen at hien@apwld.org by 30 April 2019. Please note that only selected applicants will be contacted. Diyana Yahaya at diyana@apwld.org and Hien Nguyen at hien@apwld.org who will be happy to support grassroots organisations to apply. M Waring (1988) If Women Counted—A New Feminist Economics (HarperCollins). D Elson (1993) ‘Gender Relations and Economic Issues’ Gender and Development 1(3): 6-12. Civil societies groups following the negotiations of the TPP were able to compile a list of 600 corporate advisors who were provided access to the TPP texts while the above mentioned research on the ‘RCEP: A secret deal’ details the institutionalized role for business in the RCEP negotiation.